Dropbox has added some new features in a little upgrade today. These couple of new features could actually be pretty useful for a lot of Mac users. Firstly, Dropbox does a Cloud App clone where photographs are auto-uploaded. 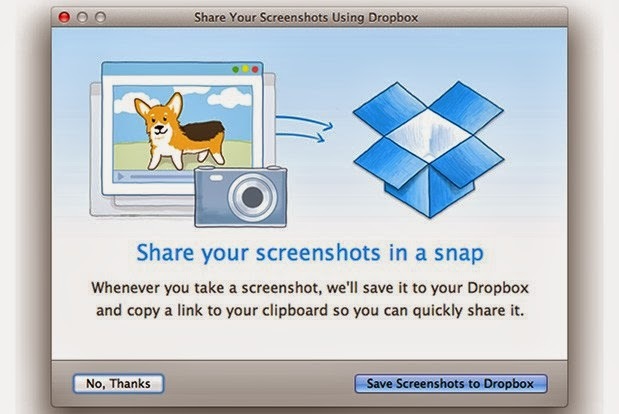 With this update a user can simply take a screenshot and Dropbox will automatically save it to the user account in cloud, as well as save the link of the screenshot to the clipboard for quick sharing purposes. This is a nifty feature as people usually take screenshots to share it with others and Dropbox will now do this automatically. This will help in easy sharing of the screenshots and a user will be able to do so by easily sharing these links saved on their desktop clipboard. Something more unique and useful perhaps is a simple iPhoto uploader. With this app users on Mac can now import copies of the photos from iPhoto for iOS, directly to Dropbox account. The update adds a new importer to the app which does the importing of iPhoto library to Dropbox with a single click. These features are add-ons to the Dropbox’s recently announced Camera Uploads feature to automatically save all photos from camera of a phone or desktop to Dropbox account. And if one does not want to integrate this update, one can simply make changes that from account settings to keep things unchanged.